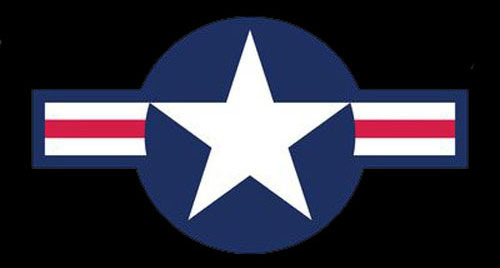 > Ever wonder what that round star & stripe graphic is that you've seen on U.S. aircraft for decades? Well, it's called the USAF Roundel. If you've ever wanted one to stick on your car, aircraft, door or anyplace else - we've got you covered. We offer 3 common sizes, 6", 12" or 16" - but we can also custom make any size you like (up to about 3 feet). These are professional vinyl graphics. They are NOT simply color printed on vinyl sheet. Each individual component of the graphic is cut separately on its specific colored vinyl. The components are then layered by hand to form the completed graphic. Ready to use and easy to apply with self-adhesive backing and transparent carrier sheet. All weather 7 year outdoor rated vinyl. Please choose size below.